The castle had fallen apart again by the 1600s. It was sold to Edward Conway by Charles I in 1627. Edward bought it for £100. Edward's son, also named Edward, took over the castle in 1631. It was a ruin. [nb 2] In 1642, the English Civil War started. John Williams, Archbishop of York, took charge of the castle for the king. He used his own money to fix the broken parts of the castle. In 1645, Sir John Owen became governor of the castle. The two men argued about this, since Williams was supposed to be running it, not Owen. Eventually Williams gave up and moved back to London. The castle was taken over by Thomas Mytton between a siege in August and November of 1646. ↑ It's hard to know how much it really cost. We can only determine it based on how much money someone makes today. We used the income that people made in 2011 and compared it to people around 1630. These prices ranged from £15,200 to £3,180,000. 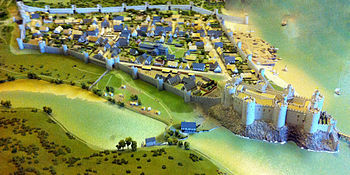 ↑ 1.0 1.1 "Castles and Town Walls of King Edward in Gwynedd". UNESCO. Retrieved 12 September 2012. ↑ "Richard II, King of England (1367–1400)". Luminarium.org. Retrieved 22 May 2013. ↑ Ashbee 2007, p. 19; "Attractions Industry News". Association of Leading Visitor Attractions. Retrieved 12 September 2012. ; "Gwynedd Destination and Marketing Audit" (PDF). Gwynedd Council. p. 22. Retrieved 12 September 2012. ↑ "Part 2: Significance and Vision" (PDF). Cadw. p. 56. Retrieved 12 September 2012. This page was last changed on 5 October 2018, at 06:28.